This post contains affiliate links. You can read more about it at our Legal & Disclosures page. Thank you! 2017 was a big year for my family and, to a larger extent, a big year for ME. I called it the Year of Jaymi, and I spent the year finding the best ways to relax, to indulge, and to carve out time for myself. I bullet journaled, I drank fancy coffee, I went on trips with my friends, and I took on two side jobs that helped me to put my unique talents to work in a way that brought more joy to my life. And it was AMAZING. And also? It was busy. Really, really busy. So how did I fit those extra jobs, side hustles, and self-care into my slam-packed, childcare and housework filled days? It took planning and mindfulness on a daily basis, but I found that “having it all” was easier than I thought once I started my day off with a fresh routine. And the best part is? You can do it, too. Here’s my tips for starting your day with a BANG. You know I’m a huge fan of The Miracle Morning by Hal Elrod (you can read more about the system in depth here), and it has me rising and shining around 5:30 am each day. This gets me a magic hour to start my day before my kids do. I am a huge procrastinator, so if I don’t spend the first twenty minutes of my day in physical activity, it is likely to get moved to the back burner. Like, the WAY back burner, where it just doesn’t get done. I like the Mari Windsor Pilates DVDs, because it is a gentle way to wake up, but still a very effective workout. After I get my exercise out of the way, I spend about 5 or 6 minutes quieting my mind. I try to tone everything else out and just sit quietly. Some days this is harder than others, and I have to repeat a mantra to help block out the noise (As in, “I am one with the force, and the force is with me”), but I am getting better at it all the time. Then I go over the list of affirmations I have written down in my Passion Planner. I have written down the traits and qualities I want to define my life, and some things I can do to work on these each day. It helps me to prioritize and help me to focus my time on the things that are meaningful to me, particularly during the next step of my day. You read all about how I use my Passion Planner as a Bullet Journal, and this is the part of the day when I rely on it the most. I pour myself a gigantic cup of coffee and spend some time planning my day. I use color coding to make sure I am prioritizing the things that really matter to me (opportunities that help others are written in orange, for example, and blog items are written in green), and try to make sure the different colors are spread out evenly throughout the day or week. I’ll work on my trackers, schedule some long term goals, and reflect on the last few weeks as I plan for the future. It’s a nice way to make sure nothing falls through the cracks, with lots of opportunities for short and long term goal setting. In the Miracle Morning system, this portion of the day is for self-reflective writing or journaling, which is particularly helpful to me when I’m working through something that is difficult or is causing me anxiety. It’s a great way to purge your thoughts or figure out an issue. If I’m not feeling particularly called to journal, I use this time to write for the Blog, plan for my art classes, or work on a project for Lila’s classroom. In theory, I read a chapter of a nonfiction or personal development book every morning. In practice, I might check the news on my phone, finish a chapter of a book I’m reading for fun, or skip this step because the kids are up and I’m out of time. But it’s a delicious treat on the days that they sleep in, or are otherwise occupied. 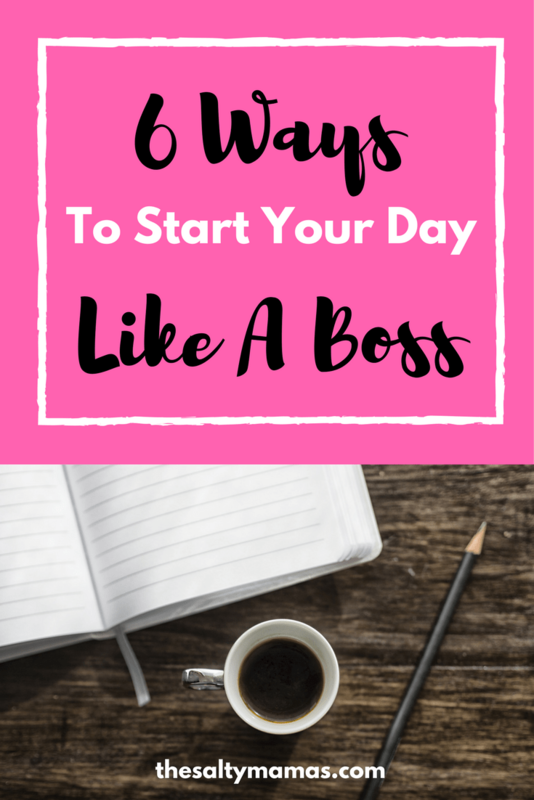 These simple steps have helped me to not only start my day like a boss, but to live my life with more passion, focus, and fulfillment. It takes a little time to get used to, but once you do? Get ready for a year that makes your dreams come true. I love this! There is so much on my plate in any given day and I have taken on new adventures and I am hoping to find ways to do everything. Starting my day like a boss is the best tactic to do. I love journaling. It helps me not only reflect but also plan. Minus the coffee…LET’S GO! These are great! I cherish my early morning time! The one I struggle with the most is exercise!! I need to fit it into my day more consistently! Such wonderful tips to begin any day. As a blogger, I love the writing aspect of these 5 the most. For me, mornings are when inspiration is easily recognized and words flow generously. Great motivational tips! What a great way to start 2018!